The newly opened museum at Masada National Park combines archeological findings with a theatrical setting, creating an experience visitors will never forget. The display explores Masada's cultural, architectural and artistic place in the Roman-Hellenistic period. 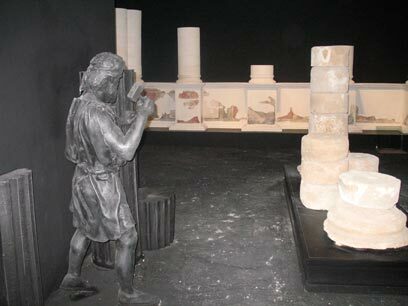 The display's nine scenes are divided into three main topics: The relationship with Rome, Herod's and the rebels'' Masada, and the Roman army. The museum tour begins with 1st-century Jewish historian Josephus Flavius and ends with the researcher and archeologist Yigal Yadin. Visitors will hear a variety of explanations – including a short play written by Ephraim Sidon – which will allow them "to see and feel" the reality of life on the desert fortress. Visitors can stroll between the different scenes which depict a period of about 100 years, and absorb the Roman culture, experience the emotions of the Jewish refugees who fled to the mountain in fear of the Romans, and re-live their last night – the dramatic fall of Masada on Passover 73 AD. Masada was named UNESCO World Heritage Site in 2001 and is considered the symbol of the epic collapse of the Judean Kingdom at the time of the Second Temple. The fortress on Masada was built by King Herod the Great between 37 and 31 BCE. The Roman barracks and rampart are the most comprehensive example of the Roman's barricade system to survive to this day. See all talkbacks "A new museum at Masada"